Any homeostatic process that changes the direction of the stimulus is a negative feedback loop. It may either increase or decrease the stimulus, but the stimulus is not allowed to continue as it did before the receptor sensed it. In other words, if a level is too high, the body does something to bring it down, and conversely, if a level is too low, the body does something to make it go up. Hence the term negative feedback. An example is animal maintenance of blood glucose levels. When an animal has eaten, blood glucose levels rise. This is sensed by the nervous system. Specialized cells in the pancreas sense this, and the hormone insulin is released by the endocrine system. Insulin causes blood glucose levels to decrease, as would be expected in a negative feedback system, as illustrated in Figure 1. However, if an animal has not eaten and blood glucose levels decrease, this is sensed in another group of cells in the pancreas, and the hormone glucagon is released causing glucose levels to increase. This is still a negative feedback loop, but not in the direction expected by the use of the term “negative.” Another example of an increase as a result of the feedback loop is the control of blood calcium. If calcium levels decrease, specialized cells in the parathyroid gland sense this and release parathyroid hormone (PTH), causing an increased absorption of calcium through the intestines and kidneys and, possibly, the breakdown of bone in order to liberate calcium. The effects of PTH are to raise blood levels of the element. Negative feedback loops are the predominant mechanism used in homeostasis. A positive feedback loop maintains the direction of the stimulus, possibly accelerating it. Few examples of positive feedback loops exist in animal bodies, but one is found in the cascade of chemical reactions that result in blood clotting, or coagulation. As one clotting factor is activated, it activates the next factor in sequence until a fibrin clot is achieved. The direction is maintained, not changed, so this is positive feedback. 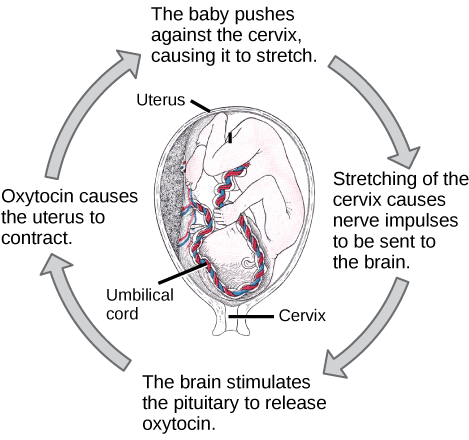 Another example of positive feedback is uterine contractions during childbirth, as illustrated in Figure 2. The hormone oxytocin, made by the endocrine system, stimulates the contraction of the uterus. This produces pain sensed by the nervous system. Instead of lowering the oxytocin and causing the pain to subside, more oxytocin is produced until the contractions are powerful enough to produce childbirth. Figure 2. The birth of a human infant is the result of positive feedback.